Tennis is a year ‘round program for kids at AR-FC. 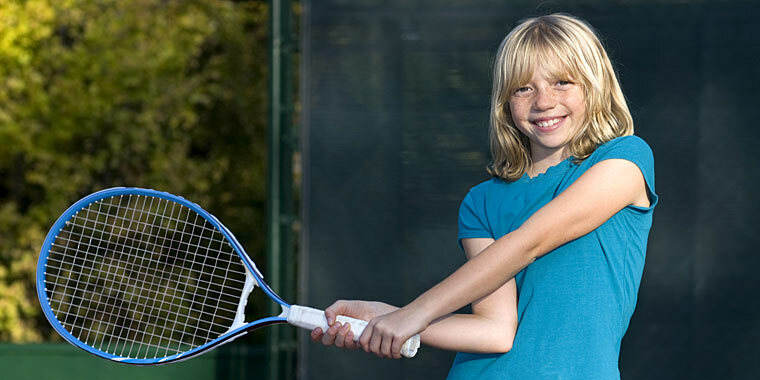 Whether your child is a beginner, intermediate, or tournament level player, our programs and staff can help them to improve their game and develop a love for the lifetime sport of tennis. Future Stars: Players will learn the foundation of basic tennis strokes through fun-filled activities. Focus is on balance, hand-eye coordination, and technique. Future Stars: Ages 5–10, Mondays and Wednesdays, 8:30–9:30 AM. Emerging Strikers: Players will be instructed in all strokes using a specific "tennis vocabulary" designed to make more advanced tennis strokes easier to learn. Emerging Strikers: Ages 9–14, Tuesdays and Thursdays, 8:30–9:30 AM. The Summer Junior Tennis Clinics consist of ten one week sessions and run from June 3rd through August 9th 2019. Each session of group lessons require advanced registration. Download the flyer (above) or contact Jordon for more information. The Summer Travel Team is for intermediate to advanced players and runs four days per week with two hour practice sessions. in addition, we will compete in USTA tournaments during the summer and play other clubs throughout the area. Team Training: Mondays–Thursdays from 10:30 AM–12:30 PM. The Summer Travel Team consists of ten one week sessions and runs from June 3rd through August 9th 2019. Download the registration form (above) or contact Jordon for more information. Take the tour and see everything ARFC has to offer, including personal training, group fitness, three heated pools, jacuzzis and sauna, tennis, smoothie bar, and much more. Get Pass Now!